Instead an international forum will be set up to discuss net issues, although it will not have any binding authority. The deal clears the way for the summit to focus on how poorer nations can benefit from the digital revolution. About 10,000 delegates, including world leaders, technology experts and campaigners, are expected at the three-day World Summit on the Information Society (WSIS) in Tunis. Disagreements over control of the internet had threatened to overshadow the summit, with countries such as China and Iran pushing for an international body under UN auspices to oversee the net. The US had stood firm against this, arguing that it would stifle technological advance and increase censorship of the internet by undemocratic regimes. The Tunis deal leaves the day-to-day management of the net in the hands of the California-based Internet Corporation for Assigned Names and Numbers (Icann), which answers to the US government. Icann will keep its current responsibilities for overseeing domain names and addressing systems, such as country domain suffixes, and managing how net browsers and e-mail programs direct traffic. The 170 nations taking part in the negotiations agreed on the creation of an Intergovernmental Forum to discuss all internet issues, such as spam, viruses and cyber crime. "We did not change anything on the role of the US government with regard to the technical aspects that we were very concerned about," said the top US negotiator David Gross after the agreement. Mr Gross said the forum would not have oversight authority nor would it do "anything that will create any problems for the private sector". Its first meeting is likely to be held in Athens, Greece, early next year. The agreement on internet governance means that delegates at the Tunis meeting can focus on how far governments have gone in their pledges for an "inclusive information society", set out two years ago at a first summit in Geneva. Back then, nations pledged to make the net accessible to all by 2015. But worldwide only 14% of the population is online, compared to 62% in the US. The Geneva summit disappointed many countries after the rich nations failed to back a Digital Solidarity Fund. The fund, intended to help finance technology projects in developing countries, was formally launched earlier this year. The voluntary fund has so far only raised $6.4m (£3.68m) in cash and pledges, so the UN will be hoping to encourage more contributions. 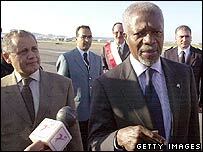 Opening the UN summit, Secretary General Kofi Annan said the task now was to make the move from diagnosis to deeds. "The hurdle here is more political than financial," he said. "The cost of connectivity, computers and mobile telephones can be brought down. "These bridges to a better life can be universally affordable and accessible. We must summon the will to do it." One effort which will receive much attention is the non-profit One Laptop Per Child group, set up by Nicholas Negroponte, chairman and founder of the Massachusetts Institute of Technology Media Labs. It plans to produce up to 15 million sub-$100 laptops within a year. Professor Negroponte will unveil the prototype at the summit. There will be hundreds of other projects, events, roundtables, high-level talks and exhibitions at the summit too. There are other larger social justice issues to be tackled, such as how to ensure freedom of expression and information for everyone on the net, an issue which bloggers will be watching closely. Ahead of the summit, there have been concerns about freedom of expression in Tunisia, following alleged assaults or harassment of journalists and campaigners on the sidelines of the event. 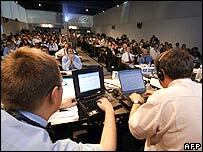 WSIS takes place in Tunis from 16 to 18 November.